Despite a continued level of consistent success during his tenure as manager of the Republic of Ireland football side, Giovanni Trapattoni has received some level of criticism for his stubbornness (some say loyalty) when selecting his sides. Under Trappattoni, the team has rarely ever deviated from the 4-4-2 formation which has served them so well. While it may not be the most adventrous strategy, there is no doubting that Trappattoni has got results as we approach the nation's first major tournament appearance since 2002. While many will point out that Ireland simply don't have the players to play expansive football, that is not the truth. Even with the more technical players of the past retired, Stephen Reid, frozen out, Andy Reid, or on a self-imposed exile, Stephen Ireland, there is still a lot of talent remaining on the sidelines for the Irish national team. Firstly you must break down the winning formula which Trapattoni has created and stuck to so rigidly. Trap is no fool, he may be stubborn, but his intelligence and abilities as a manager should not be under examination after such a distinguished career. Of course reputation means very little as far as performance goes, but there is no real reason to argue against Trapattoni's achievements with Ireland either. As with every side since he became the starter, Trapattoni's team is dependant on the quality and experience which Shay Given brings to the field. Given, when fit, is always the first choice for Ireland and should be for quite some time despite his age. Whether Trapattoni wants to play an attacking or defensive team, Given is, rightfully, the first choice at the back every time. For the most part, Trapattoni has selected the versatile John O'Shea at right back, Richard Dunne and Sean St. Ledger in the middle with Stephen Ward on the left. Because of O'Shea's defensive versatility, Trapattoni's back four essentially has three central defenders within the back four. That strength, both physically and in defence, fits Trapattoni's overall vision of the side. Unlike many managers who make the mistake of overlooking the overall picture when concentrating on team selection, Trapattoni cannot be accused of not thinking through every decision he makes. With this back four in place, Trapattoni has looked to insert as many of his best defenders as possible while building a side which wouldn't be expecting to dominate possession. Looking at the midfield with that in mind explains why he chooses to employ two work horse central midfielders. Glenn Whelan and Keith Andrews may not be the most talented of footballers, but both are willing workers and good ball winners. Trapattoni doesn't ask them to dominate the game like a Xavi or Bastian Schweinsteiger with the ball at their feet, instead the role requires both players to focus on defensive duties and contribute going forward when possible. Every player on this version of the Irish team is required to work as hard as possible to keep the team's shape and not give away easy goals. The only two players, outside of the forwards, who really have attacking responsibilities are the two wingers. Damien Duff and Aiden McGeady have never been great at linking play together with short passing moves. Both are players who look to get the ball into their feet and run at defenders before crossing into the box. This is the mainstay of Ireland's attack in this formation as they look to feed Kevin Doyle, or Jonathan Walters depending on who is the selected target man, with Robbie Keane playing off the main striker. Even though the attacking options aren't exactly overwhelming in this formation, there is an obvious thought process to Trapattoni's favored formation. A thought process which has reaped many rewards during his time as the main man in Ireland. Even though Trap's formula has been a successful one, the fans who clamour for better quality of football also have a point. The Irish squad isn't a talentless bunch, there are a lot of quality footballers available, who are capable of playing at the highest level. While the depth of England, Spain or Germany isn't available, neither should we be reduced to replicating a Sunday league side on occasion. Defensively, John O'Shea is the key to Ireland becoming a more attacking force. Building from the back is just as important as having a deadly striker to finish off moves, if you intend to play as an attacking group. O'Shea is one of Ireland's best defenders no matter where he lines up. In fact, if you require him to, he is also a more than capable central midfielder. For Ireland's attacking eleven however, O'Shea would slot inside from his right back position to become another ball-playing center-half. O'Shea, alongside Richard Dunne, would give Ireland a presence comfortable with the ball at their feet and allow the back four to feed the midfield in a way suitable for more attacking football. Moving O'Shea inside would allow a more traditional right back to move outside such as Stephen Kelly. Kelly may not be a star in defence or attack, but he is more than capable of starting at the international level and would be an improvement with the ball at his feet over Sean St. Ledger. Unsurprisingly, the most drastic difference between an attacking Ireland and a defensive team comes in midfield. Damien Duff may be an Irish stalworth who has given more to the national team than most in recent years, and while he remains a very creative player, he no longer has the legs to repeatedly beat defenders while not being capable of creating with his passing ability. Aiden McGeady is somewhat of a one trick pony as his narrow minded play often makes him fairly predictable. McGeady isn't the greatest crosser or passer and struggles to get on the scoring charts consistently. Despite being the attacking outlets on the defensive team, both players would be dropped from Ireland's best attacking lineup. James McClean may be an inexperienced player at any level, he hasn't even played for Ireland yet, but his play on the field carries with it an unprecedented level of maturity which is rare in players of his age. 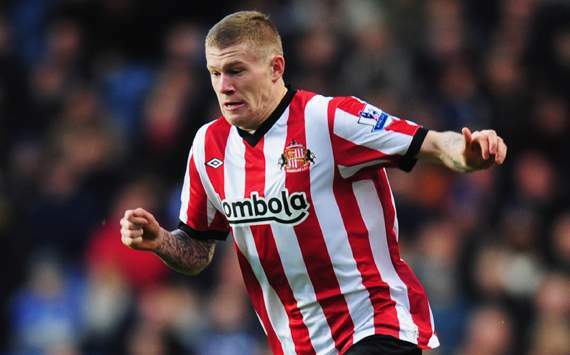 McClean has an abundance of talent which makes him a viable starter for his country. His physical fitness and work rate allows him to consistently contribute in both defense and attack while his skill with both feet makes him both a dangerous dribbler and viable passer. As far as link up play and getting into scoring positions, he shows better intelligence than McGeady while his athleticism gives him an edge over Damien Duff. On the other side, another youngster was pushing his way into the team prior to being injured. Seamus Coleman has had some injury issues this year, but should be availabel come the summer. Coleman's quick feet and constant motor is reminiscent of Stephen Hunt except that he has a better end product and greater overall awareness. A combination of McClean and Coleman gives you two versatile attacking threats who can pick apart defenses in multiple ways. The center of Ireland's midfield is often a lightning rod for fans to vent their frustration. Realistically, asking Keith Andrews and Glenn Whelan to run a midfield is unfair. Both are good work horses with the ability to consistently win the ball and break up play, however neither will ever pick apart opposing defenses with the ball at their feet or dominate possession. Whelan is the more composed option of the two and could stay on the field in a five man midfield playing the Claude Makelele role of anchoring the midfield. However, for consistency purposes, lets keep this team in Trap's favored formation: 4-4-2. Without either Whelan or Andrews in the side, two midfielders who complement each other must be brought in. Keith Fahey may not be as aggressive a tackler or as intense a runner around the field, but he is more than capable of playing Glenn Whelan's role in the team. Fahey would bring better composure and ball retention to the midfield playing in a deeper role, something which he has done for Birmingham this past season. He would have the capabilities to join the attack while also tracking runners in defense. Pairing Fahey with Wigan's James McCarthy would give Ireland four ball-playing midfielders capable of retaining possession and creating chances for the team's strikers. McCarthy is better suited to breaking forward from midfield and playing more of an advanced playmaker role which would suit the type of game which Fahey is trying to play. With a midfield and defense preferring to keep the ball on the ground and play it around, Kevin Doyle and Jonathan Walters' value to the team lessens. Instead of having Walters or Doyle in the line-up for their physical presences, Ireland would be better served with some combination of Robbie Keane, Simon Cox and Shane Long. Long and Keane would appear like the ideal options, with Keane dropping off of Long leading the line, but Cox and Keane could also form a partnership which fits the formation and ideology. It is certainly wishful thinking to imagine Giovani Trapattoni ever lining up with such an adventrous side, and who knows maybe it would be a mistake to trust in the talent. It is more likely that Trapattoni finds a balance between both systems to try and maximise the team's chances at winning. Because John O'Shea is a better right back than Stephen Kelly, and the drop-off between them is greater than the drop-off between St. Ledger and O'Shea at center-half, it would only make sense that the original back four was kept in place. From there, bringing in both wingers from the attacking team makes sense because neither is limited in what you can ask them to do. Glenn Whelan becomes the key. Obviously Giovani Trapattoni doesn't want to change his formation, and doing so would actually require him to drop his captain so it will never happen, but pitching a five man midfield around Whelan as the anchor with a target man to lead the line such as Long, Doyle or Walters, could potentially help Ireland reach their full potential at both ends of the field. Ireland have already qualified for the European Championships, the draw for the group stages has been made so seeding is not important right now. Therefore, victories right now mean nothing. Experimentation right now that could make what is needed for victories later clearer simply makes sense.